0:00 When you record narration with your video the app will automatically detect silence in the narration. 0:06 When silence is found in the narration it will be highlighted on the timeline and this icon will appear next to the Narration heading on the right. 0:15 Clicking the icon will show a menu with the total number of detected sections of silence. You can adjust the minimum duration of silence you'd like to detect by clicking this dropdown. For example if you'd like to only see silence that is over 3 seconds then you can drag the slider or click and type the number 3. 0:36 If you'd rather not see the sections of silence on the timeline then you can uncheck the "Show Silence" option. 0:42 When the app finds silence we give you a few different options to edit them out. You can choose to cut out all sections of silence or choose to speedup all sections. 0:53 You can also individually edit each section of silence. The easiest way to go over each section is to click at the start of the timeline and then hold down the Ctrl or Command key on the Mac and press the right arrow key to seek to the next edit on the timeline which in this case is the detected silence. 1:13 When you seek to a section of silence you'll see this icon. Clicking the icon will give you options to edit this section. With one click you can speedup or cut the silence or you can "absorb" the silence which is an operation that will apply a speedup to the underlying video so it runs slightly faster and the silence is no longer needed. 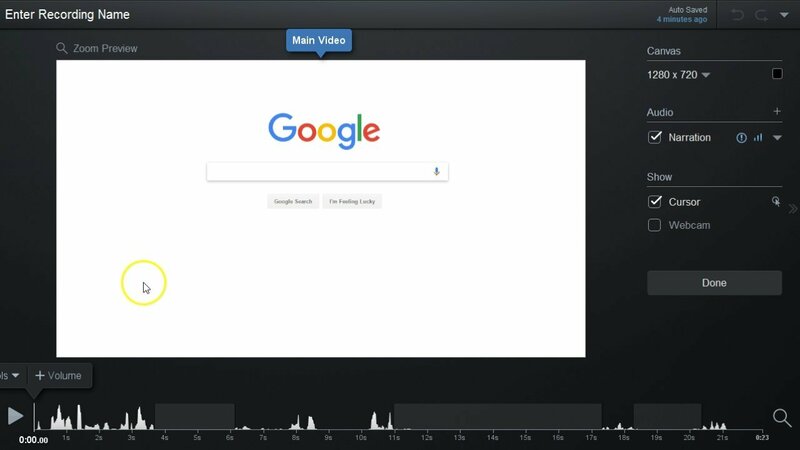 1:35 For example if we have this video where we inform the viewer that we're about to type in a search term in google but then it takes a few seconds to type. Instead of having the viewer sit through those seconds of silence we can absorb that time which will speed up the video so the typing appears to happen while we were talking instead. 1:54 Absorbing silence is only useful if you aren't recording a webcam since it will make the webcam video out of sync with the audio but with screen video it can be very useful. 2:04 In addition to the one click cut and speedup offered in this menu you can also seek to a section of silence and then choose the normal Cut or Speed Up tool and the app will automatically select the current section of silence so you can fine tune a cut or speedup if needed.